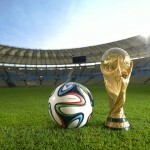 For, the second period, second sales phase, 284,597 tickets have in total been allocated to cover the first 24 hours of the 2014 FIFA World Cup. Brazil is still the country boasting the highest number of tickets requested, standing at 207,649. Following closely behind are USA, Colombia, Australia, Argentina, England, Mexico, Chile, France and Canada, with the sales period expected to end on 1st April, 2014. The stage now has been set for Brazil 2014 FIFA World Cup Final Draw. Spain, Chile, Netherlands and Australia have been pooled together, which has captured the interest of many soccer enthusiasts. Italy, England, Uruguay and Costa Rica comprise yet another intriguing pool. Ghana, Germany, Portugal and USA constitute one group as well, while hosts Brazil will have to contend with Mexico, Croatia and Cameroon. Honduras, France, Switzerland and Ecuador seem to be widely unpredictable as is the case for Group C, made up of Colombia, Japan, Greece and Côte d’Ivoire. FIFA Secretary General Jerome Valcke conducted the Final Draw, which took place in Salvador at the plush Costa do Sauípe. The eight teams which have won the World Cup before were represented by Cafu, ALcides Ghiggia, Fabio Cannavaro, Sir Geoff Hurst, Fernando Hierro, Zinedine Zidane, Mario Kempes and Lothar Matthaus.